This post is an update on an old toy line from Spain that I originally covered a couple years ago. Back then I had only a few of these figures. I've since been able to put together a full set, so I thought it was about time to revisit these weirdly wonderful chunks of plastic with more pics and information. 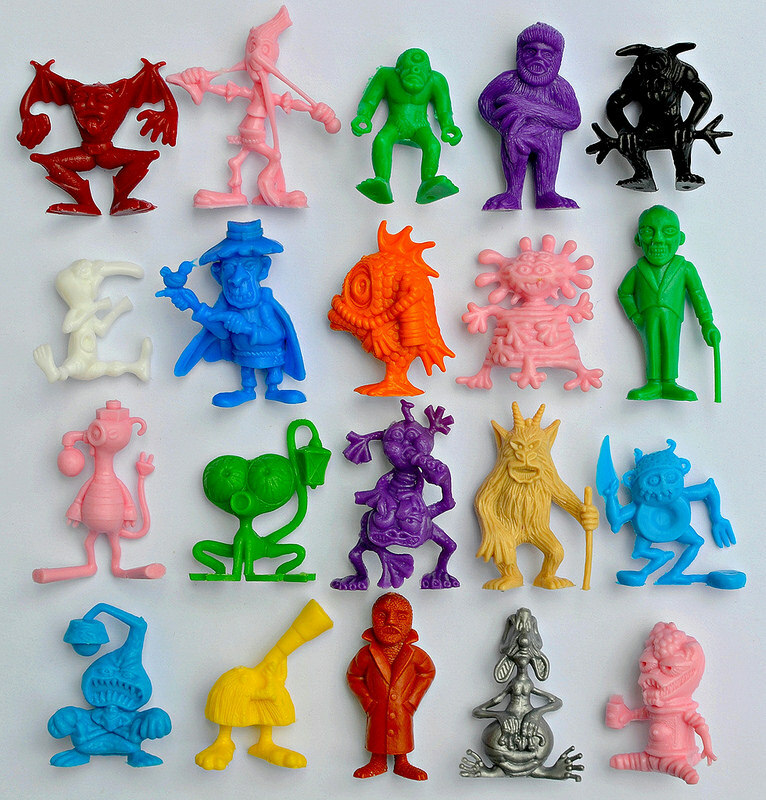 To quickly recap the basics, this set consists of 20 different hard plastic monsters around 1.5 inches tall, with each sculpt produced in many colors. 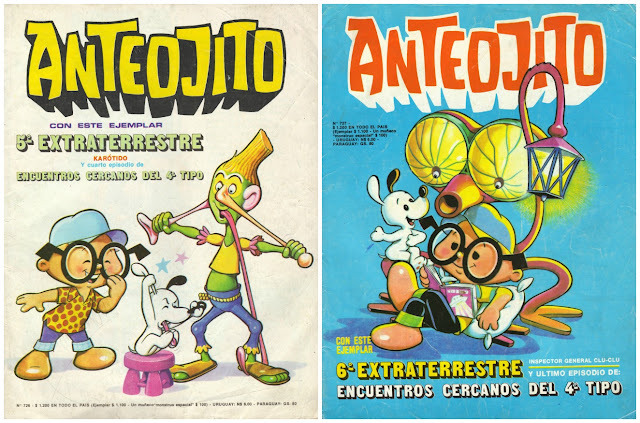 From what I have gathered, they came as premiums with snack foods in the late '70s and '80s in Spain and Portugal, with at least some of the figures also available in South America. They were included with food products from a company called Matutano, which is why they're usually referred to as "Matutano Monstruos" or "Monstruos de Matutano." Other company names that are also regularly included in listings for these figures are Tito, Disvenda and Dunkin. 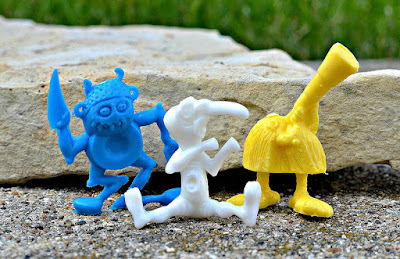 It appears that some of the sculpts were inspired by creatures from existing properties. For example, the monster wearing the trench coat brings to mind the 1959 film "The Hideous Sun Demon," and the furry horned monster looks to be based off the demon in 1957's "Night of the Demon." These are some of my favorite mini figures, mainly because of how bizarre and creative some of the sculpts are. Looking for a figure of a humanoid baby attached to a frog-like monster? You can find it here. How about a chair monster with a lamp protruding from its head and a little dude sitting in it? Check. Whoever sculpted these clearly had a lot of fun with it. The set has two different Cyclops. It also has two different furry guys. 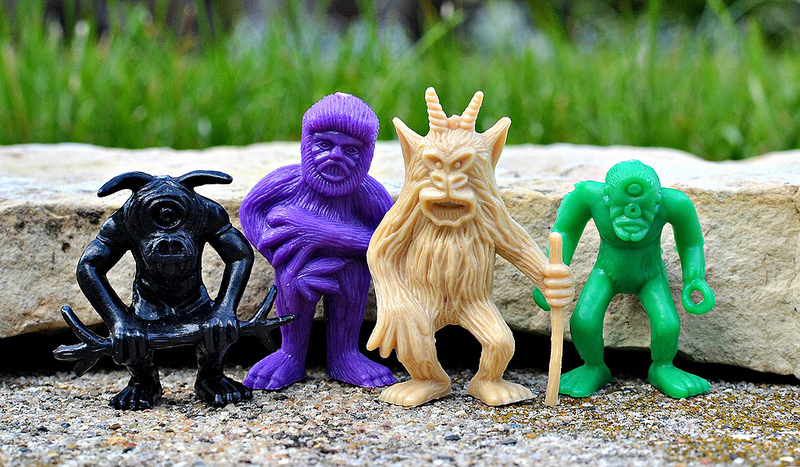 I'd guess the purple one is a yeti. 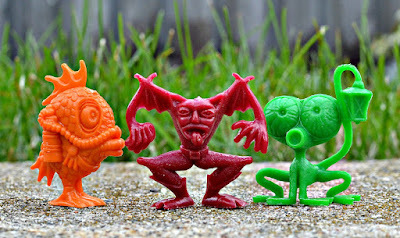 In my opinion, these animal-monster hybrids are three of the coolest freakazoids in the set. Monster minis always look awesome in pink, and the Monstruos are no exception. Check out the dude on the end stretching out his ear, nose and tongue! 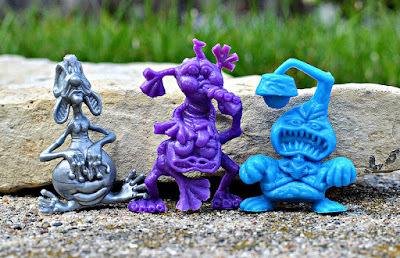 Three of the wackiest Monstruos. There's that amphibious baby thing I mentioned above. 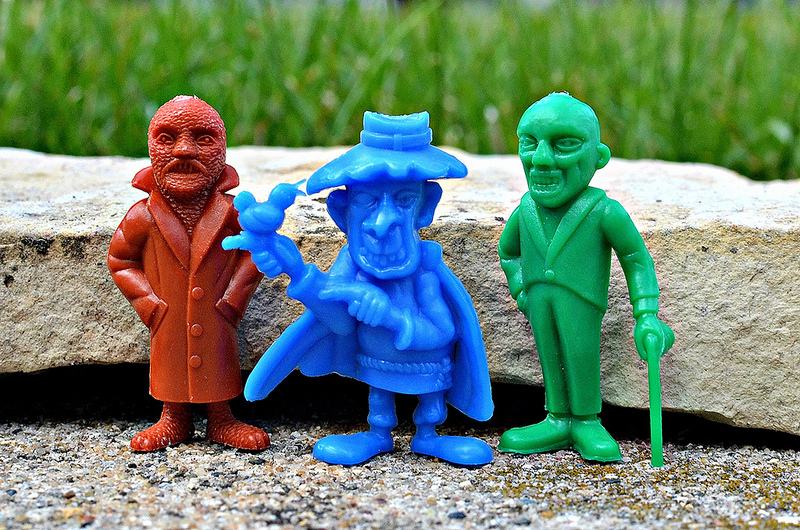 A few ghoulish-yet-dapper gents smiling for the camera. And there you have it -- the marvelous Monstruos de Matutano. It can be a challenge hunting down a full set of these, but it's definitely worth it. 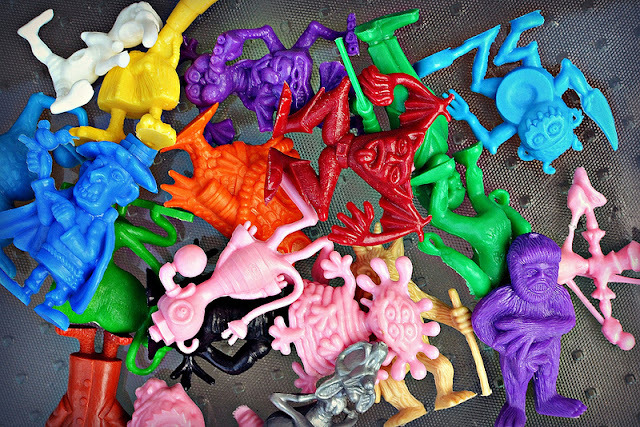 They'll instantly make any toy collection crazier and more fun. 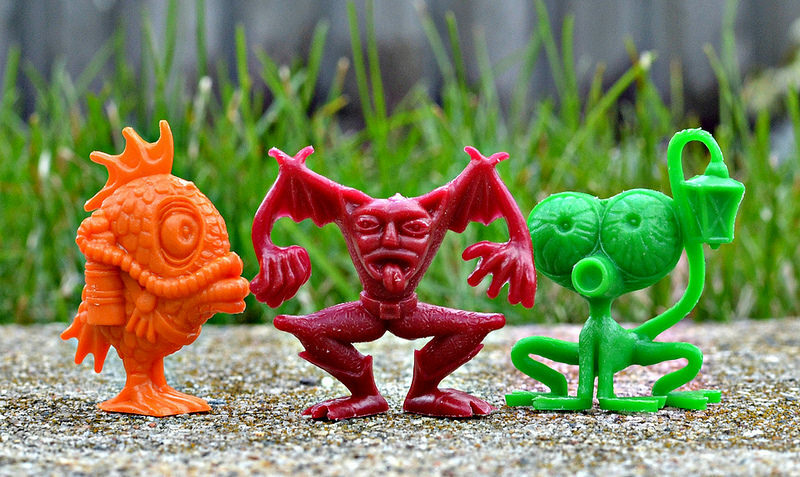 What do you think of these little weirdos? 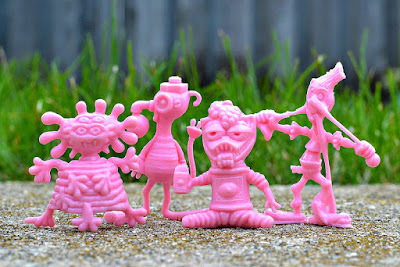 Great post & pics, great toys. 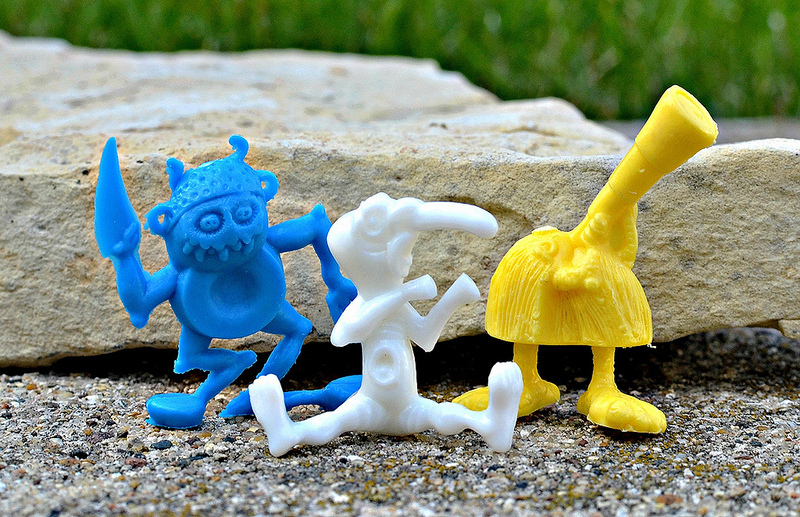 My favorite is the "yellow yeti"
Bah, you've got me wanting to get the full set of these now! Haha, well they are pretty irresistible. Thanks again for your help, I really appreciate it!